Plan B is the guide book for those of us who have ever said, "This isn't how life is supposed to be playing out." (I think that encompasses all of us.) Or if you thought by now you'd have that degree/job/marriage/child (fill in your dream) that you'd been hoping for. Perhaps you got to where you wanted to be only to have your success toppled by loss, illness, unemployment, or any number of other dream-crushers. Life has turned on a dime and now you find yourself constantly wondering where God is in all of this disappointment. After all, isn't He aware of the plans you have for you? Why won't He just show up and make it all okay again? In Plan B, Pete Wilson takes our questions, struggles, nagging doubts and moments of faithlessness and sifts them gently through wise teaching, real-life experiences and Scripture. 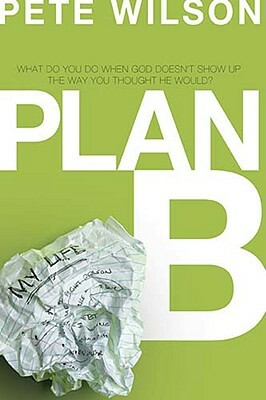 The book uses examples of other believers who have endured overwhelming and unexpected plan B life-altering situations, as well of stories of Moses, Joseph, Job, and more who throughout biblical history experienced their own plan B's centuries ago, and how God worked in all of these situations for His glory. I loved reading Plan B. It was a hard book to put down because the more I read, the more I recognized myself in what I was reading, and the more I came to realize how universal this concept must be among people; surely there are scores of us living lives different than the ones we dreamed of. This book offers hope and direction to those of us who wonder, "What's next?" There's nothing as constant as change. Be ready. Order your copy of Plan B today! Great review!! Such a "can't put down book." I am passing this title along to friends.